KIDBOX, the first kid’s style box to deliver cool brands, significant savings, and a mission to clothe children in need, is poised to make a big splash this Back-to-School season. 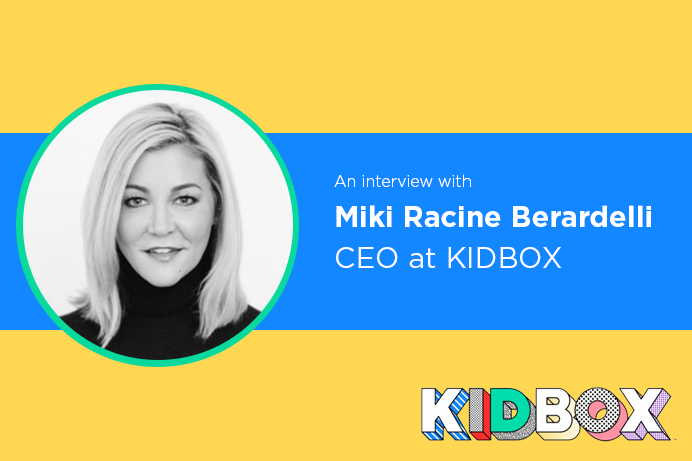 Led by Chief Executive Officer, Miki Racine Berardelli, KIDBOX provides customers with a cheerful experience, bringing parents and kids together to discover new styles, save time, and bond over the joys of community giving. KIDBOX offers a fun, practical, and unique way to shop for clothes – creating a meaningful experience for both kids and parents. Berardelli, who joined the company in September of 2016, is an industry expert and a marketing heavyweight. She has decades of executive and leadership experience as Ralph Lauren’s Senior Vice President of Marketing, Tory Burch’s Chief Marketing Officer, and Chico’s Chief Marketing Officer and President of Digital Commerce. She recently told Digital Commerce 360, “I love to build.” That’s certainly a good thing considering KIDBOX seems to have tapped into a promising opportunity with lots of room to grow. And with KIDBOX’s first, full Back-to-School season just around the corner, it’s the perfect time to strut their stuff. DemandJump was eager to get the inside scoop on some of KIDBOX's strategies heading into BTS. We sat down with Berardelli for a few quick questions. Here’s what she had to say! What is the focus of KIDBOX's back-to-school efforts? Our focus is always to provide cool, premiere brands at amazing prices. KIDBOX is the ultimate convenience for parents shopping for their children as we provide a personally styled collection of fashionable items straight to the doorstep. We find this especially relevant to the busy back-to-school season. And, kids love the fun experience, from completing their style profile, to receiving a box addressed to them, to the unpacking and try-on moment, so we are focused on tapping into that sensibility. What marketing strategies are most important for this back-to-school season? Social continues to be very important for KIDBOX, but we are also exploring additional marketing channels, both in the digital and traditional space. It's important to break through the noise as so many brands are marketing to parents and children at this time, so we want to be creative and differentiated from the marketplace. How has back-to-school strategy changed in the last year? Back-to-school 2016 was really our first big season as we launched in Beta in the spring and summer prior. We've learned a lot since last year and will apply those learnings to our 2017 back-to-school strategy. We want to allow our customer to tell us how he/she prefers to engage in the season and exceed expectations through exemplary customer service and communication. We've also added many new brands to our mix so we are excited to offer a broader assortment for our customers. KIDBOX serves as a vehicle that delivers brands literally over the threshold of a household. Our customers embrace new brands that perhaps in the past they may have not considered, and discover brands that they were not formerly aware of. Be on the lookout for KIDBOX this BTS season. The company is scaling quickly under Miki’s leadership. She and her team are building something great in the world of personalized fashion for kids. For more on KIDBOX’s social mission, see the below excerpt from KIDBOX.com. KIDBOX Cares is [a] partnership with Delivering Good, a nonprofit dedicated to providing new clothing to children in need. For every full KIDBOX purchased, a new clothing item will be given to a child who really needs it through a charity of your choice. [Their] goal: To distribute new clothes to over one million children in need. [KIDBOX] invites you to start a conversation with your family about the importance of giving back and fostering a culture of generosity. Delivering Good, previously known as K.I.D.S./Fashion Delivers, is celebrating 31 years of helping people in need and has distributed more than $1.3 billion of new product donated by companies like KIDBOX. For more on Miki and KIDBOX, check out the articles below.